Hey there! I’m Liz. I’m in my 30’s and from Wales in the UK. For the past 12 years, I’ve been surviving at work. For a long time, I didn’t survive – I was an exhausted shell who dragged herself through the day, hour-by-hour. But then things changed. I stumbled upon a framework of support systems, which I harnessed to make sense of my environment and understand how I operated within it. My exhaustion subsided into energised excitement. I started feeling in control and I began to enjoy my working days. Not only that, but I achieved promotion in a promotion-scarce environment and a coveted placement on an exclusive, accelerated advancement program. Not only was I surviving… I was thriving! Like I said, I hadn’t always survived so successfully. There were times where I found work exhausting and confusing. I’d drag myself to my desk each morning feeling drained. I felt sapped by meetings, perplexed by politics and frustrated by red-tape. Each day I felt like a part of me was chipped away – to the point that I was no longer certain what my strengths or skills were. I dreaded the thought of going to work and all my personal energy and professional efforts were used to simply getting through each day. One winters morning, I was driving to work in the dark (yet again) through the wind and rain. All of a sudden, I realised that I couldn’t do it anymore. I couldn’t continue as I had… something had to change. At that point in my life – and like many of you today – I wasn’t able to just up and leave my job. I had massive financial and personal responsibilities, which were dependent on my generous and regular income. Similarly, I wasn’t able to “up and go” to another job. Not only were well-paid jobs hard to find where I live, but my confidence in myself and my abilities had dwindled to an all-time low. So what could I do? I decided to focus on what I could do. I asked myself “what can I change?”. It was then that I decided the only real choice I had was to stay exactly where I was and take decisive action… it was time for me not just survive, but to thrive at work! My first action was to negotiate a side-step move into another job within my workplace. I figured that the new role would give me a little space – a blank canvass and a fresh challenge to test out my new approach. Little did I know that not only would it do that, but it’d actually give me the road map to do it effectively! My new job introduced me to the principles of Lean and Six Sigma. All of a sudden, I was emerged in a role where my objectives relied on the successful application of defined models, step-by-step approaches and tested theories. I’d died and gone to work heaven! Everything made sense! Difficulty making a decision? I had tools to make that easier. Needed to engage stakeholders? I had an approach to successfully accomplish that. Influencing people? I knew how to do that effectively. As the months went by I began to enjoy work again. I’d imperceptibly shifted from exhausted existence to successful survival. Plus… I was thriving! All because of a survival kit packed with workplace tools. Tools that helped me successfully negotiate the tricky paths that I used to stumble over each day. This survival transitioned and flourished as I moved through various roles – I continued to survive and I continued to thrive. I’d struck workplace survival gold! So, what about Survive at Work? A few months ago, I made the life-changing decision to leave my job so I could achieve my dreams. I’d finally built enough confidence in my abilities to take that brave leap. Of course, the realisation that I had another 35 years of working before retirement, helped nudge me on my way! While I start carving a new career doing something I love, I decided to set up this website. I want to share the value I learnt along my survival at work journey, in the hope that it’ll help others who find themselves trudging down the same path. Surviving at work can be reactive, exhausting and confusing. But the fact is, it needn’t be. Effortless surviving and successful thriving can be something that YOU start today! The fact is, whatever you do for a living, you need a toolbox… a toolbox packed with tools, techniques, models and systems that you can use to do your job effectively, effortlessly and impressively. I want to help you identify which tools YOU need to thrive at work and then help you use them. There’s such a vast array of Frameworks out there which can help you make sense of your environment, enable you to make the best of any situation and place you firmly back in the driving seat of your career. So let’s find them together! On this website I’ve brought together everything I discovered and successfully deployed to survive and thrive at work. Hopefully this will help you too… not only to survive, but to effectively thrive at work. 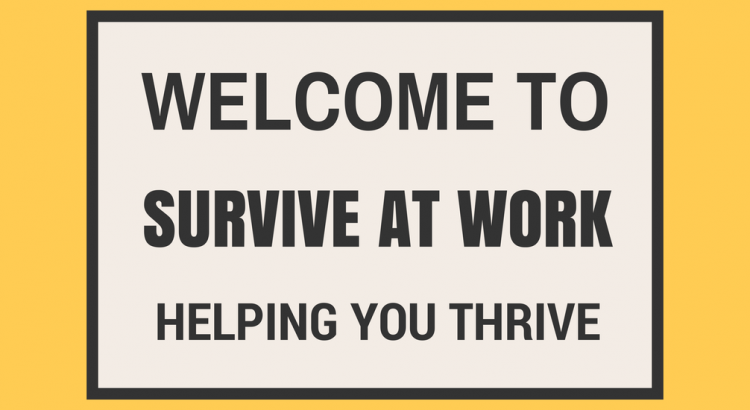 Get my FREE Report: 5 Things You Need To Do To Survive And Thrive At Work! Sign Me Up!